Monster Energy AMA Supercross, an FIM World Championship, took over Ford Field for its 12th round of the 2017 season and showcased bar-to-bar racing in front of 46,324 fans. The Monster Energy Kawasaki rider Eli Tomac continued to prove he’s on a mission for the championship as he claimed his fourth-straight victory, bringing him just seven points back of reigning champion Team Red Bull KTM Factory Racing’s Ryan Dungey. A wild Eastern Regional 250SX Class race saw Troy Lee Designs/Red Bull/KTM’s Jordon Smith take his first career victory on the final lap. Entering points leader Rockstar Energy Husqvarna Factory Racing rider Zach Osborne finished 18th and relinquished the championship lead to Monster Energy/Pro Circuit/Kawasaki’s Joey Savatgy. Opening the Main Event was Team Red Bull KTM Factory Racing’s Marvin Musquin grabbing the SupercrossLive.com Holeshot. At the end of the opening lap, it was Musquin leading with Tomac and RMATV/MC-WPS-KTM’s Davi Millsaps close. 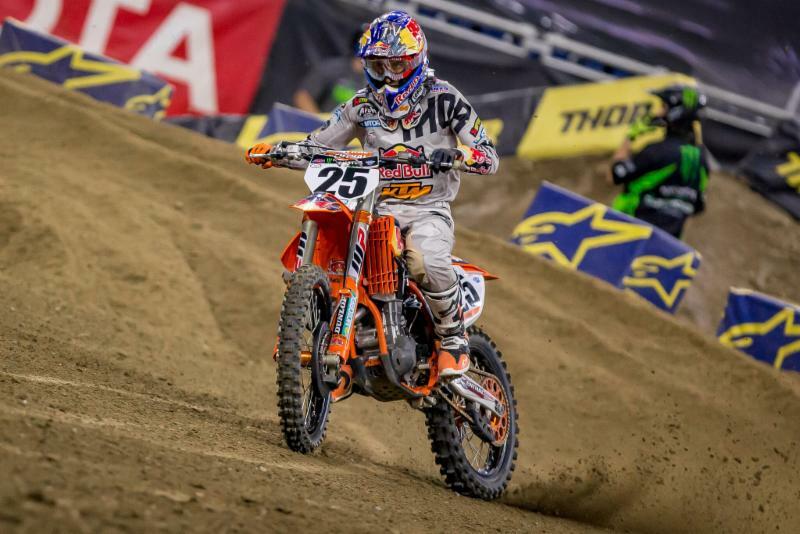 As the leader pulled a gap on the rest of the field, points leader Dungey came around the opening lap in seventh. It only took three laps for Tomac to make his move on the KTM rider Musquin and start his charge to pull away from the pack. Musquin did his best to put up a fight, but the Kawasaki rider quickly put seconds on second place. While Tomac was lengthening his lead out front, Dungey was busy making up as many points as possible, moving into fifth on Lap 3. He quickly got by Monster Energy Kawasaki’s Josh Grant for fourth, but it took more time to get by Millsaps, making his move for the final podium spot on Lap 21. Tomac would cross the finish line 8.4 seconds ahead of Musquin, who was just two seconds ahead of his teammate Dungey. Musquin led laps before relinquishing the lead and finishing second. Prior to the start of Tomac’s win-streak, he faced a 27-point deficit to Dungey. Tomac’s fourth-straight win and seventh victory this season places him only seven points back of the championship lead with five races remaining. 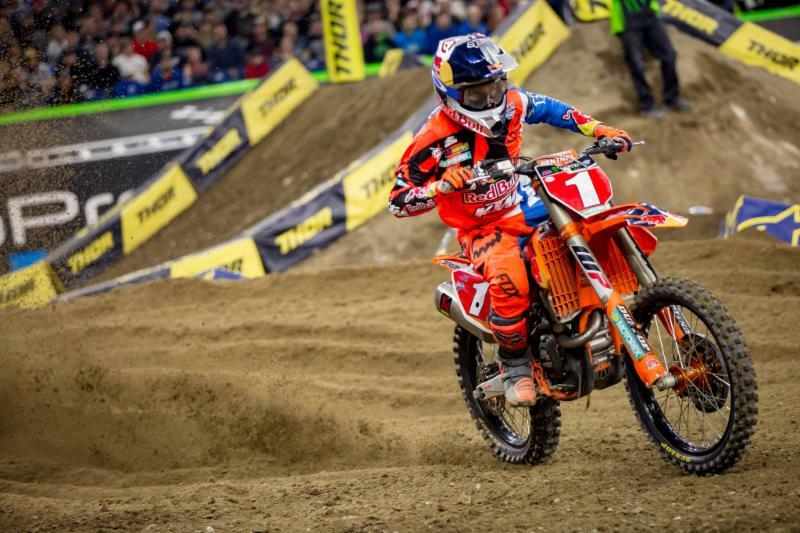 Musquin gained solo hold of third in the standings, sitting 47 points behind Dungey. Dungey was forced to come through the pack once more. The Eastern Regional 250SX Class Main Event started with Monster Energy/Pro Circuit/Kawasaki’s Adam Cianciarulo grabbing the SupercrossLive.com Holeshot, but a pileup behind him collected entering point’s leader Osborne. As the opening lap commenced, it was Cianciarulo, Yamalube/Star Racing Yamaha’s Dylan Ferrandis, Savatgy, and Smith all together in the hunt for the lead. The riders were barely around their first lap when Ferrandis got by Cianciarulo, and then on Lap 2 Savatgy pulled into the lead with Cianciarulo in tow. On Lap 3, Cianciarulo went down and Ferrandis and Smith raced by, but the Kawasaki rider was able to remount in fourth. On Lap 5 while leading, Savatgy surrendered the lead to Ferrandis after going down. The Frenchman Yamaha rider would chalk up another eight laps in the lead before the duo of Smith and Savatgy over took him for the top two spots, respectively, on Lap 13. With championship implications for both riders, Smith and Savatgy duked it out with Savatgy entering the final lap with the lead. Just a few corners after receiving the white flag, Smith sped by Savatgy and was able to hold on to receive the checkered flag and celebrate his first career victory. As Smith took his spot on top of the podium and Savatgy second, remarkably Cianciarulo came from several seconds back to secure the final podium position in third after passing Ferrandis with two laps to go. Entering points leader Osborne was able to return to the race, but ultimately finished 18th and relinquished the points lead to Savatgy. Smith’s win puts him second in the championship standings. The shake-up of Osborne’s 18th-place finish propelled Savatgy into the Eastern Regional 250SX Championship lead with nine points over Detroit winner Smith. Osborne is third and 10 points back of Savatgy. 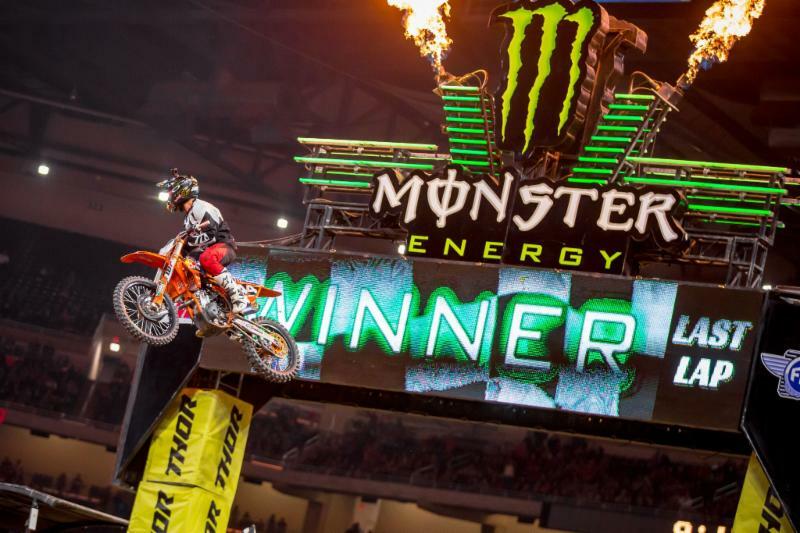 The 2017 Monster Energy Supercross season continues next Saturday, April 1, for the 13th round of the championship inside The Dome at America’s Center in St. Louis. Live broadcast coverage can be seen on FS1 beginning at 5 p.m. PT / 8 p.m. ET. 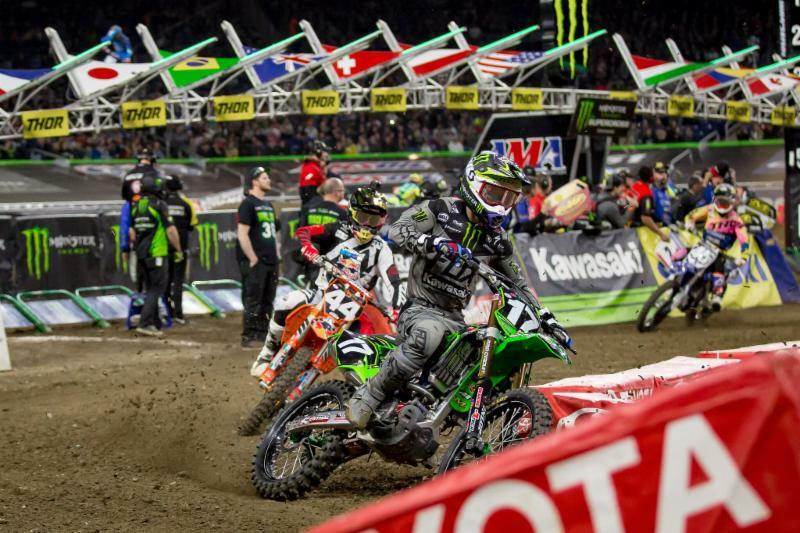 Savatgy (17) nearly had his second win of the season, but regained the points lead.